…from so simple a beginning endless forms most beautiful and most wonderful have been, and are being, evolved. Spiders are everywhere in these woods now, so I decided I should probably photograph some and write a few observations to share. The other day I went downstairs to observe one that has repeatedly strung a web across the basement door, requiring me to duck or sweep a hand every time I want to go out to fill the bird feeders. But, as often happens in my wanderings, something else extraordinary caught me eye. It must have flown inside while I had the door open gawking at the spider dangling just outside. I saw it creeping along the inside glass on the door and immediately forgot all about the spider. This was a critter that I had seen only a few times, and never photographed, and here it was, and me with camera in hand. Unfortunately, it was in a strange location for a picture, waist-high on the inside of a double-pane glass door. But, my motto is always take the photo, and try to get a better one later. Okay, so maybe this pic doesn’t scream, really cool insect!! 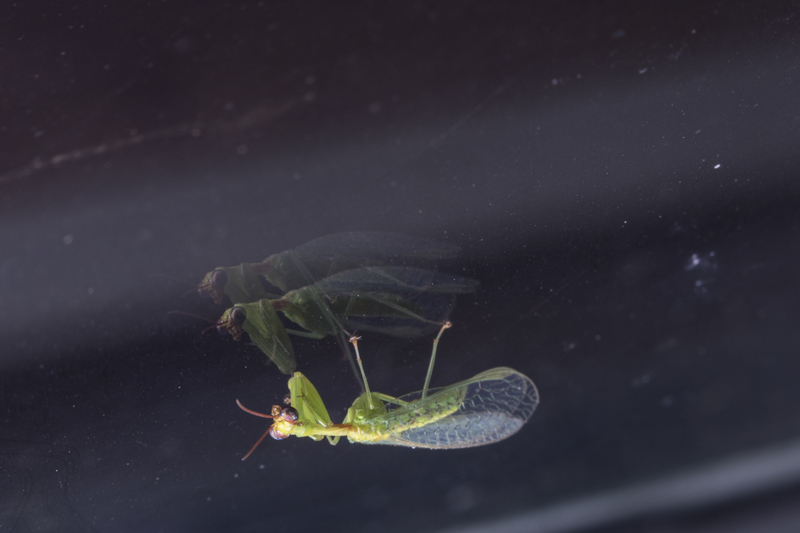 I moved closer, took a few more, and, in Lightroom, wiped out the second of the two reflections of the bug caused by the door glass. Now, maybe you can see why I was so excited. This is a Green Mantisfly, Zeugomantispa minuta. It is only a little over a half inch in length, and is definitely distinctive in its design. It has raptorial front legs, complete with spines for holding its prey. 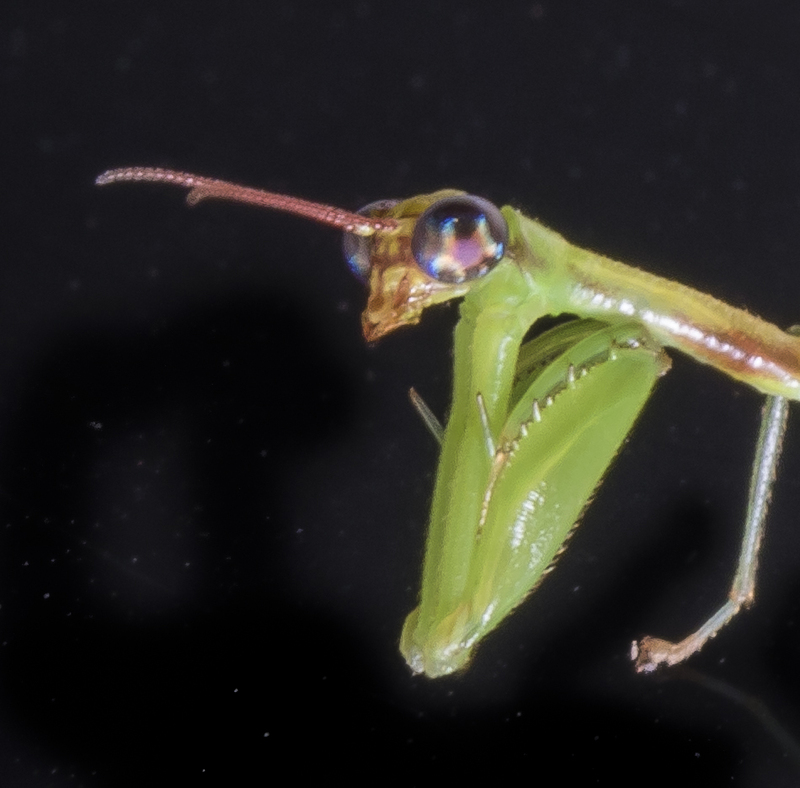 Those, along with the head and large eyes, make this look like a close relative of some sort of mantid. 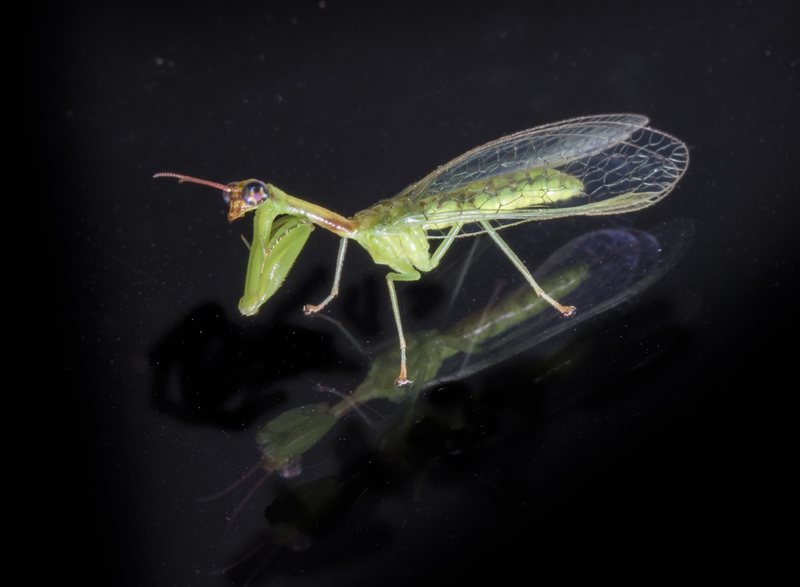 But, the rest of the body looks more like a Green Lacewing. 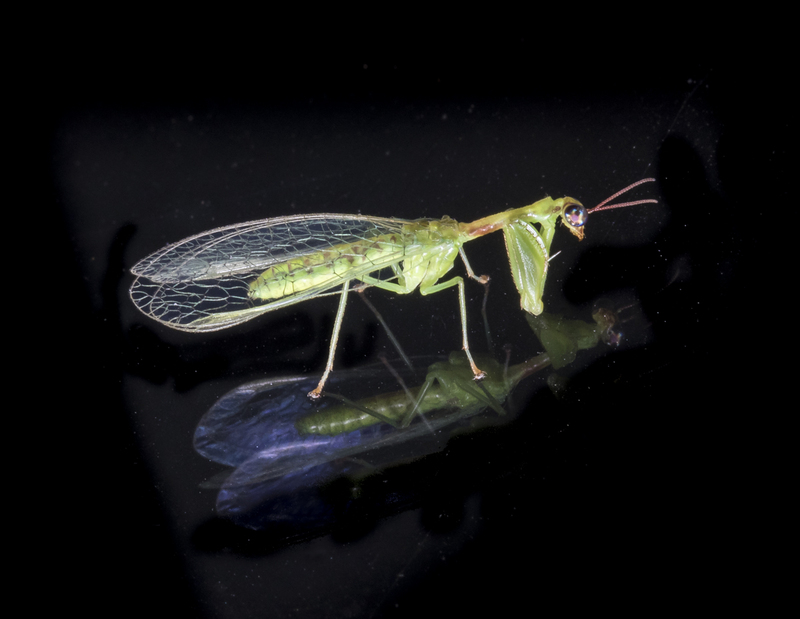 In the wonderful reference, Kauffman Field Guide to the Insects of North America, the Green Mantisfly is described as resembling a science experiment gone horribly wrong. I couldn’t agree more. And then I read about its life history, and it took on a whole new level of weirdness. While the adult feeds on a variety of small insects (as you might suspect, given its mantid-like front half), their larval habits are more surreal. Larvae consume spider eggs inside the egg sacs. There are a few species of mantisfly in our region, including one whose rear half resembles a wasp. Depending on the species, the larvae may actively seek out spider egg sacs and then enter them, or it may hitch a ride with a female spider. When she starts constructing an egg sac, the mantisfly larva will enter it and dine on the eggs. Some have reported that, if the larva instead grabs onto a male spider, it will wait and transfer to a female when the spiders mate. The well-fed larva then pupates inside the spider egg sac and later emerges from it as an adult. Once again, I am astounded by the complexities and surprises found right outside (or, in this case, inside) my door. 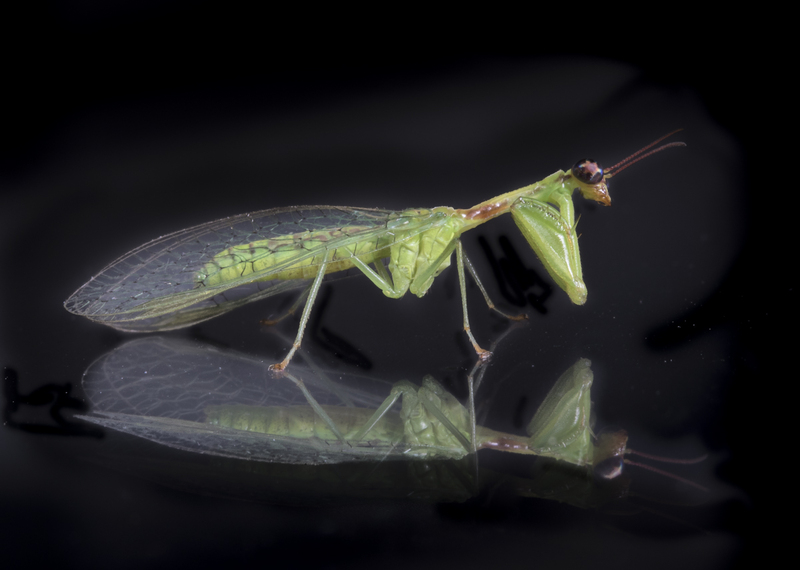 This entry was posted in Natural History and tagged green mantisfly by roadsendnaturalist. Bookmark the permalink. This is almost too good to be true! I agree, Eve. What an amazing little insect! And a bizarre life cycle.